A leaky heart valve, when the mitral valve is the valve involved is known as mitral regurgitation. The most common cause of this leaky heart valve is mitral valve prolapse and it is the most common valve related disease in the US. Other causes include an enlarged heart and coronary artery disease. 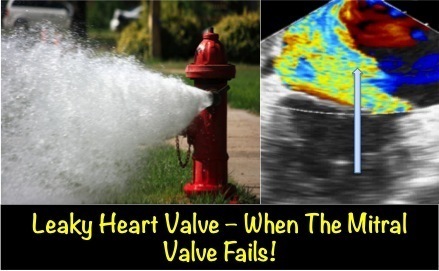 See some of my prior posts to review the normal mitral valve, and also what happens to the valve in mitral valve prolapse. Every time the main chamber of the heart beats, it ejects blood forward in to the body so it can supply the body with the blood that it needs. The mitral valve is there to prevent blood flowing backwards. So in the case of a leaky heart valve, blood is allowed to leak backwards. The amount of leak (regurgitation) can range from being very mild to very severe as shown in the pictures above. 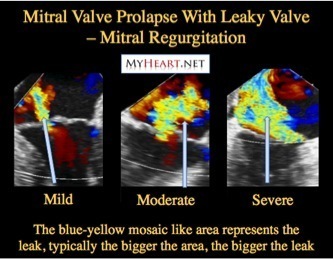 The amount of mitral regurgitation in mitral valve prolapse is usually related to the amount of prolapse. 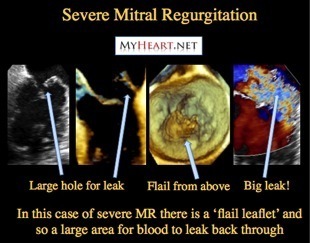 In some cases, as discussed in the last section, the chords attaching the mitral leaflet to the heart muscle can snap leading to flail leaflet and a very very leaky heart valve that we call torrential mitral regurgitation! In cases of severe mitral regurgitation, and almost always in the case of flail leaflet, surgery is almost always required. When there is a mildly leaky heart valve most of the blood is still going forward and the body hardly notices. This is common, and the vast majority of people with mild mitral regurgitation will never notice it or need anything done about it. When there is a severely leaky heart valve however, so much blood is leaking backward that the body may well not get the blood that it needs. This can lead to symptoms such as fatigue and shortness of breath. Another complication that can be associated with larger degrees of leakiness is an irregular heart beat that occurs from extra stress placed on the top chamber of the heart that has to accept all the leaking blood. Lets briefly discuss how we define how severe the leaky heart valve is is. Of course as can be seen in the pictures, an ultrasound test called echocardiography is the way we usually do this. It’s important to note that although good, it’s not an exact science! So in reality one should look at many factors together when determining how severe the regurgitation through the leaky heart valve is. But in general when less than 30% of the blood in the main chamber leaks backward it is in a milder category, and when more than 50% of the blood leaks backward it is certainly in the severe category. In between is generally considered a moderately leaky heart valve. We will discuss in more detail, the management of mitral regurgitation of varying degrees of severity and complications associated with a significantly leaky heart valve in further posts. Mitral Valve Prolapse – Can It Cause Death? 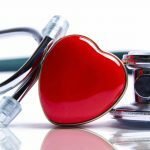 Mitral Valve Prolapse – Can Medicines Help? Will an increase in heart rate cause change in amount of a modorate heart value linkage? I had mitrial valve repair five years ago . Phrenic nerve was damaged on the right lung. This has resulted in shortness of breath. Today I learned the valve has a small leak. Could this leak also be contributing to my shortness of breath. A small leak is not likely to be related.